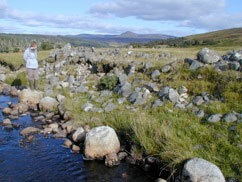 The site was first visited in September 2002, by Nick Lindsay and Jacquie Aitken, when it was noted that the non-dressed, tumbled stone wall remains of a ruined building were beginning to be undermined by the river. The building measures approximately 11m x 4.5m and its sidewalls stand around 0.4m high, whereas its more substantial gables are around 1m high. The building is orientated NE-SW and has a similar sized building parallel to it around 7m to its SE, both ruins being part of a stone walled enclosure extending to the NE. 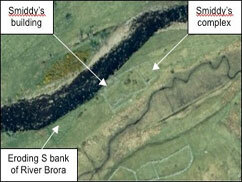 The complex is set on a well-drained, linear, grassy ridge, bounded by the River Brora to the NW and a boggy, wide, linear channel (probably a former natural course of the river, more recently forming the downstream part of a mill lade) to the SE. The complex forms the northern part of the large, spread out township of Kilfeddermore, the existing 5 families of which were cleared by the Sutherland Estate in May 1820. During the 2002 visit, several small pieces of iron slag, a 10cm x 3cm x 3cm piece of timber and a freshwater mussel shell were discovered in the eroding bank beneath the north sidewall. Later visits have revealed that more of the bank has disappeared since then and the building will be soon lost to the river. During the Clyne Heritage Society guided walk to Kilfeddermore in October 2006, several pieces of iron slag from a bloomery were discovered in the eroding bank, one piece being the size of a grapefruit. This was good evidence that the building was ideally positioned to be a smiddy, and there are references to one in the Hearth Tax records of 1694, occupied by an Angus Gow. We aim to investigate the interior of the building, which remains intact at the moment, but it is only a matter of time before the walls are breached and this internal area will also disappear. 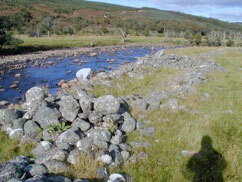 It is important, therefore, to conduct an evaluation survey and then an excavation. We will not be removing any of the stonework of the walls (unless already undermined by the river); the investigation will focus on the interior of the ruin and the ground outwith and immediately adjacent, in an effort to learn more about the nature and function of this important building within the township. Our investigations will be on an ad hoc, occasional day basis, rather than an intensive continuous block (like the salt pans), only when numbers are available and when the weather is good. Plan of the smiddy complex, showing the threat of erosion. 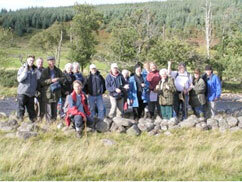 Clyne Heritage Society guided walk to Kilfeddermore October 2006 – the group is standing inside the Smiddy building ruins, holding some of the pieces of slag found in the eroding bank.